Louisiana will not conduct any executions in 2016 or 2017 as a result of a new court order issued with the consent of the parties in federal proceedings challenging the constitutionality of Louisiana's lethal injection process. At the request of the Louisiana Attorney General, a federal judge has delayed proceedings on the state's lethal injection protocol for an additional 18 months, making January 2018 the earliest date the state could resume executions. Attorney General Jeff Landry asked for the extension because the facts of the case are in a "fluid state" and it would be "a waste of resources and time to litigate this matter at present time." The request marked the third time in two years that the state has asked to delay the trial. In June 2015, after the state's execution drugs had expired, its lawyers told the court that Louisiana lacked the drugs necessary to carry out executions. In February, the Louisiana Department of Corrections indicated that the state still did not have the drugs needed to conduct an execution. Previously, in 2013, the state had considered purchasing execution drugs from a Tulsa, Oklahoma, compounding pharmacy that was not licensed to provide drugs to any pharmacy in Louisiana, making any purchase of drugs from that company by the Louisiana State Penitentiary Pharmacy illegal under state law. That compounding pharmacy, which secretly sold execution drugs to Missouri during the same period, was implicated in nearly 2,000 violations of Oklahoma pharmacy regulations. The state later obtained one of the execution drugs it needed from a hospital in Lake Charles, misrepresenting to the hospital that it needed the drugs for medical purposes. Christopher Sepulvado, one of the two inmates named in the challenge to the constitutionality of Louisiana's execution procedure, was originally scheduled to be executed in 2014. Louisiana's protocol allows for either a one-drug execution using pentobarbital, or a two-drug execution using midazolam and hydromorphone. The state does not have the drugs necessary for either option, according to a spokesperson for the Depatment of Corrections. Louisiana's last execution was in 2010. Pfizer's recent announcement that it was tightening controls against what it calls the misuse of its medicines in executions highlights an on-going struggle between states desperate for execution drugs and a medical community that believes its involvement in the lethal injection process violates its medical and corporate missions and the ethical standards of the pharmaceutical and health professions. As Pfizer and nearly two dozen other pharmaceutical companies have ended open market access to drugs potentially used in executions, states have responded by increasingly shrouding the execution process in secrecy. The states "are mainly concerned about losing their providers of lethal-injection drugs should the companies’ names become public," says Linc Caplan in a recent article in The New Yorker. Otherwise, "companies that do not want their products associated with executions will know that their drugs are being used." He reports that since the Supreme Court upheld Kentucky's execution protocol in 2008, 20 states have responded to drug shortages by abandoning protocols that had been substantially similar to Kentucky’s, making "unfettered substitutions" to their protocols in "desperate attempts to adhere to their execution schedules.” Caplan reports that States "have also been increasingly misleading in their efforts to obtain drugs for executions." He cites documents showing that one Ohio official urged state drug purchasers to identify themselves as from the Department of Mental Health and warned they should "not mention anything about corrections in the phone call or what we use the drug for." Louisiana similarly obtained execution drugs from a local hospital, which mistakenly assumed they were needed for medical use. Last week, an Oklahoma grand jury report described that state's secrecy practices as producing a "paranoia" that "clouded [prison officials'] judgment and caused administrators to blatantly violate their own policies." An article by Chris McDaniel in BuzzFeed after the release of that report documented that the same secrecy and lack of oversight criticized by the Oklahoma grand jury is common in other states, and has contributed to execution problems in Missouri, Georgia, and Ohio. Arizona and Missouri paid executioners in cash, and Missouri's mismanagement of that fund likely violated federal income tax law. Missouri's secrecy, McDaniels writes, also "allowed it to purchase execution drugs from a pharmacy in Tulsa, Oklahoma, that was not licensed in Missouri and had questionable pharmaceutical practices." Other states, like Texas and Arizona "have used the secrecy to purchase drugs illegally," he reports. U.S. District Court Judge Neil Wake ruled on May 18 that a lethal injection challenge brought by Arizona death row prisoners may move forward, preventing Arizona from carrying out any executions before the reported expiration date of its supply of a key execution drug. Arizona has said that it is unable to replenish its supply of midazolam, an anti-anxiety medication that a number of states have used as a sedative in multi-drug lethal injection procedures. The death row prisoners are challenging the state's use of midazolam in conjunction with a paralytic drug, saying that "midazolam is not reliable as a sedative, which means the paralytic will mask the inmate’s pain." Judge Wake called the argument "plausible on its face," and said that it was not blocked by earlier U.S. Supreme Court rulings. Baze v. Rees had reviewed the constitutionality of a drug protocol that had employed an anesthetic that, unlike midazolam, "would render the inmate insensate to pain caused by the paralytic and the potassium chloride." Wake also said that the Supreme Court's decision in Glossip v. Gross—which involved midazolam but was decided at a preliminary stage of a challenge brought by Oklahoma death row prisoners, without a full evidentiary record—did not control the outcome of this case because the Arizona inmates "will present substantial new evidence challenging midazolam’s efficacy as a sedative." The judge also criticized the state's conduct in carrying out six separate executions, saying, "In recent history, the Department has deviated from its published execution procedures in ways ranging from minor to fundamental. It has deviated in the course of an execution without explanation." Judge Wake said that Arizona's "unlimited major deviations" from its execution protocol, and its claim that the state had unfettered discretion to deviate from its protocol at any time, "threaten serious pain." The ruling paves the way for further litigation on the prisoners' claims that Arizona's protocol violates the Eighth Amendment ban on cruel and unusual punishment. However, the court dismissed other claims brought by a coalition of media groups that the state's denial of information about the drugs violated the First Amendment. Previously, Arizona had used drugs believed to have been illegally brought into the country to execute Richard Landrigan. The FDA impounded a later shipment of drugs that it said Arizona had attempted to import from India in violation of federal law. More than 12,000 pages of California prison documents disclosed by court order on May 7 reveal problematic conduct by state officials and the extraordinarily high price tag the state would have paid for lethal injection drugs if it were carrying out executions. The American Civil Liberties Union of Northern California, which obtained the documents after a six-month legal battle, say they show that the California Department of Correction and Rehabilitation (CDCR) significantly understated drug costs, advocated violating federal law in attempting to acquire execution drugs, considered obtaining execution drugs from questionable sources, and downplayed the seriousness of botched executions in other states and the prospects that botches could occur in California. The ACLU requested the documents under the California Public Records Act, saying they were crucial to informed public comment on California's recently-proposed one-drug execution protocol. Among the information revealed in the records were wildly inconsistent estimates of the cost of obtaining pentobarbital—one of four proposed lethal injection drugs. CDCR initially estimated drug costs at $4,193 per execution. Emails indicate that a compounding pharmacy agreed in May 2014 to provide 200 grams of the drug to the state for an initial cost of $500,000, but only if the company's name was kept secret. A second source quoted a price of $1,109 for 500 milligrams of pentobarbital. The emails state that 324 grams would be required to execute the 18 inmates who have exhausted their appeals, for a total cost of $718,632, plus unspecified fees to cover "service costs." The proposed protocol, however, calls for 60 grams: "Estimated chemical costs are based on a total of 60 grams. This includes the 37.5 grams required by the regulations for carrying out the execution plus 22.5 grams used during training." Based on the price quotes from the emails, 60 grams of pentobarbital would cost between $133,080 and $150,000, bringing the cost of 18 executions to $1.06-$1.20 million. Texas' Third Court of Appeals heard oral argument on May 11 on the state's appeal of a trial court ruling requiring it to reveal the identity of its lethal injection drug supplier in a pair of April 2014 executions. The suit, initially brought on behalf of the two executed prisoners, now implicates Texas' Public Information Act. The prisoners' attorneys argued that identifying the supplier of pentobarbital, the drug used by Texas in executions, was necessary to verify that the chemicals had been prepared correctly and would not cause an unconstitutionally painful execution. Then-Attorney General (now Texas Governor) Greg Abbott said that releasing the drug supplier's identity would present a threat of physical harm, because a previous drug supplier had received hate mail and threats after being identified. In December 2014, District Judge Darlene Byrne rejected Abbott's argument and ordered Texas to disclose the identity of the compounding pharmacy that had prepared the drug. The state appealed that decision. In Wednesday's hearing, defense lawyers characterized the alleged threats as "vague" and nonspecific and said they were no basis to bar public disclosure of the information. Prosecutors, without identifying the source of any threat, argued that the safety of the pharmacy was at risk because, "There's an identifiable group of people who think lethal injection is wrong—morally, politically and socially—and they are determined to oppose it." Chief Justice Jeff Rose raised concerns about the implications of allowing a broad exemption to the Public Information Act, asking, "Where do we draw the line … without blowing a hole in the (Public Information Act) big enough to drive a truck through anytime the government says, 'Well, gee, this can cause harm?'" Justice Bob Pemberton said, "It seems a potentially boundless exemption." The scope of the decision is likely to be limited, because the Texas legislature passed a law shielding execution drug suppliers, which took effect in September 2015. Arizona's last execution, the botched lethal injection of Joseph Wood in July 2014, sparked controversy and legal challenges to the state's lethal injection procedure, and came at a time when Arizona was struggling not only with the logistics of carrying out executions, but also broader issues of fairness and costs. In a sweeping piece for The Arizona Republic, Michael Kiefer, who witnessed Wood's execution, describes the historical and legal background that led up to Arizona's current hold on executions. He describes how Arizona's list of statutory aggravators — factors that make a case eligible for the death penalty — became so expansive that then-Governor Jan Brewer vetoed a proposed aggravator in 2014 because she worried it would make the death penalty law unconstitutionally broad and vague. Kiefer notes Arizona's 42% reversal rate in capital cases, meaning that 129 of the 306 death sentences in the state were reversed or remanded by higher courts. Nine people have been exonerated in Arizona, and one, Jeffrey Landrigan, was executed despite test results weeks before his execution that found DNA from two different men, but not Landrigan, on the victim's clothing. Landrigan was executed in 2010 using lethal injection drugs imported illegally from London. 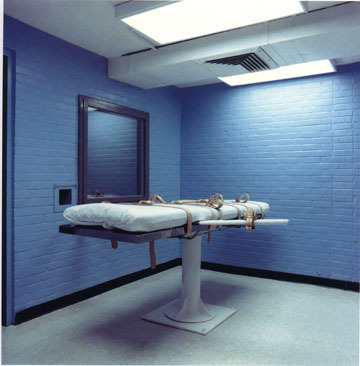 The U.S. Drug Enforcement Administration later seized the remaining drugs, causing Arizona to switch first to pentobarbital and later to midazolam, the first drug in Wood's botched execution. U.S. District Judge Neil Wake halted all executions in Arizona, asking the state to clearly specify what drugs it has and how it intends to carry out executions. His ruling is expected soon.